ESPea is a new Wi-Fi development board from AprilBrother technologies. It uses the ESP8266EX chipset as the main micro-controller and supports the Arduino environment. 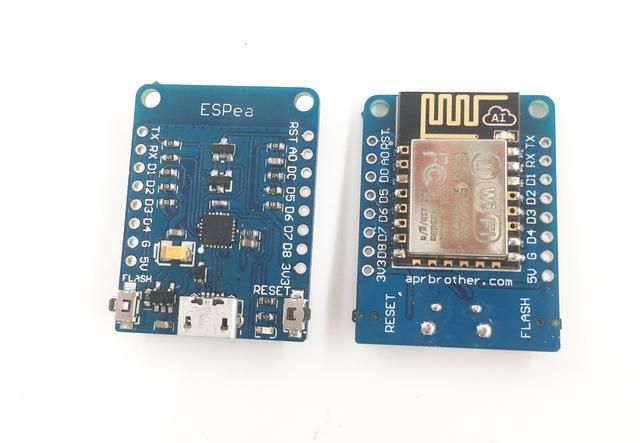 At the ESPea&apos;s heart is an ESP8266 WiFi microcontroller clocked at 80 MHz and at 3.3V logic. This microcontroller contains a Tensilica chip core as well as a full WiFi stack. You can program the microcontroller using the Arduino IDE for an easy-to-run Internet of Things core. We wired up a high-quality SiLabs CP2104 USB-Serial chip that an upload code at a blistering 921600 baud for fast development time. It also has auto-reset so no noodling with pins and reset button pressings. The CP2104 has better driver support than the CH340 and can do very high speeds without stability issues. Comes fully assembled and tested, with a USB interface that lets you quickly use it with the Arduino IDE or NodeMCU Lua.